From Nigerian emails to fake Blizzard Beta emails we live in a world in which internet scams take place. I’m going to focus on some of the more common World of Warcraft scams and what you can do to prevent it from happening to you! Most of what I am going to explain is what is known as a Phishing Scam, that is trying to con you into going to a website that looks official but it’s really not. Gifts from a whisper. I’ve received, oh I don’t know, probably about 20 of these whispers in the past 4 or 5 months. In essence they try to tell you that you have won a prize (gold, vanity pet, free gear, mount, etc) but that you have to go to a certain website to register. Once on that website it will ask you for your Warcraft Account name and Password. Guess what? There is no prize. And on top of that, you just lost your account! In game mail scam. Isn’t that a Star-Craft title? 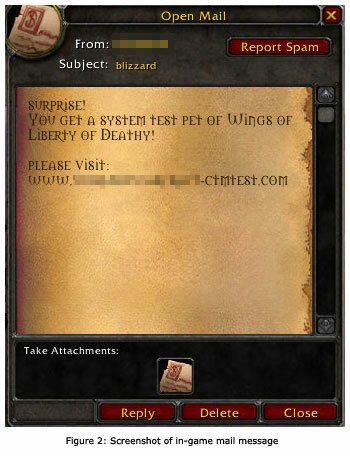 Anyways, like the whisper, the email scam also tells you you have won a prize (gold, vanity pet, free gear, mount, etc) and to go to a website to claim it. Just like the whisper scam they will try to get your user name and password. Don’t even bother to reply to these mails. Usually the moment they are sent, within seconds the account is deleted so it cannot be traced when a GM ticket has been made. Here we have a whisper that has been made to look like it came from a Blizzard Employee. But it’s not. It is again asking for you to go to a website so that whoever it is can get your account name and password. 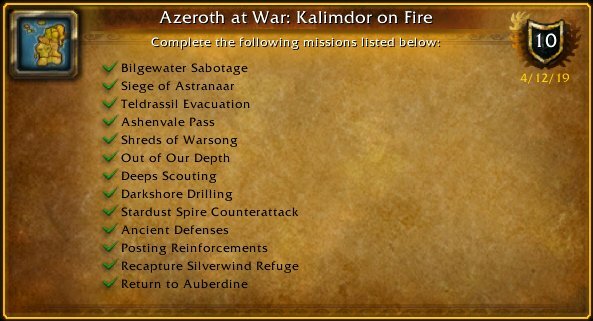 A) For about a year before Cataclysm came out (and before Lich King came out) I would get about 5 or 6 emails a day telling me that I’ve been accepted into the Closed Alpha Test or Closed Beta Test. It would then direct me to a website in which, you guessed it, they wanted me to enter in my account name and password. B) As of writing this today, I’ve received an email supposedly from Blizzard claiming that they are investigating that I may be selling my account. They remind me that it is against their Terms of Service and that I must confirm that I am the original owner of the account. Again it directs me to a website wanting my account name and p-word. C) I also got an email today explaining that many players are getting emails from people who are trying to steal their accounts. It goes on to say that Blizzard was to adopt some measures to safeguard my account and that they want me to download a ‘package of code protection’ and they they offer it to players ‘free of charge’. Ahhh! They want me to go to a website and enter in my Warcraft account name and password! D) I also got an email today (this makes #3) telling me that my Warcraft payment was not made, so I need to log in and make a payment. Yep, it wants me to go to a website and enter in my account name and password. 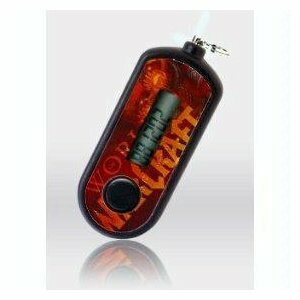 Blizzard World of Warcraft Authenticator! This is a handy little device that will generate a 6 digit code that you will enter after you enter in your account name and password. The other thing you can do is simply avoid clicking on or visiting those websites! Never EVER give your account name and password to anyone! Not even to your trusted best friend! Once it gets out of your hands, who knows where it will end up! Cats and dogs will start living together, it’ll be anarchy! Yes, the Authenticator costs a little scratch, but to have a good means of security is well worth it in my opinion. Oh! And those of you with these new-fangled smart phones can also download an Authenticator Application from Blizzard. I’m not going to post a link to their online store (because hey, I just may be trying to phish you – I’m not but as Fox Molder says, ‘Trust No One”) but you can easily find it by using your favorite search engine.